This thing is mostly about checking stuff out on a bike. I write it because I think sharing stories is neat. Sometimes I race, but mostly I just like being on my bike. When I first picked up a mountain bike (which was my dad’s really sweet Gary Fisher Hoo Koo E Koo), I rode it around a bunch of slag heaps and beside the railroad tracks in Western Pennsylvania. Then I rode it up a little tiny Pennsylvania mountain, had to stop halfway because my legs were cramping up so bad. I was hooked after that, started racing cross country, then did some endurance races, then hundred milers, thought I wanted to be some sort of sponsored bike racer dork, then moved on to big dumb bikepacking races like the Tour Divide and Colorado Trail Race. But like I said before, the main point of the bike riding is to see new stuff. 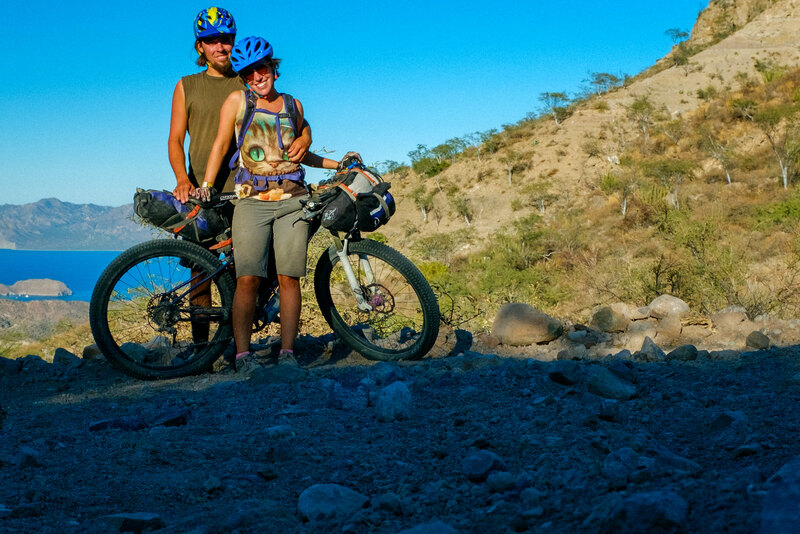 Dirt touring (or bikepacking or whatever) is a really cool way to do that. I’m really lucky to have a riding partner with benefits. “So you’re out of work? Off work? Or are you trust fund babies?” asked the really horrible drunk woman from LA, dribbling ice cream down her chin. We were sitting outside of a little store off the highway, a few months into a tour in Baja. Then she kind of wrinkled her nose. “But you don’t look like trust fund babies.” Or smell like them apparently. A quick note on how traveling a bunch works, moneywise. Because I always wondered. There are tons of ways to do this, but for our situation, this is what we’ve figured out. Colleen and I were living in a little cabin in Colorado a couple years ago. After I finished the Divide race, and rested a little, I really wanted to go back out for a longer ride. But since we were locked into a year-long lease, and spending most of our paychecks on rent, that wasn’t going to happen unless something changed. So I spent a lot of time on Craigslist that winter (I was working a really easy ski tech job in Aspen), and found a van. It’s named the Shark, because it’s so sleek and fierce. It cost $3000 (or two months of rent in a tiny Colorado cabin), and it’s 41 years old. We moved into it that summer, and now we can save most of our paychecks for half the year, and go bike tour the other half the year. We park where it’s legal to park, move it around, and overall live pretty comfortably. I work as a bike mechanic, bike tour guide, and do some occasional magazine freelancing. Colleen is a mostly photographer or works in gear shops. I also have student loans (thankfully not a crushing amount, since I lived at home and in raft guide employee housing during school), which I’m paying off slowly. I could pay them off faster, but I could also get hit by a bus tomorrow. Then I’d probably wish that I would have gone bike riding instead of stressed about paying down my loans. I’m lucky to have really supportive family and friends who get it, or at least try to. A dirtbag can’t get by alone. And I know I’m also really lucky to be living in pretty fat times, and to be a citizen of a pretty fat place, and to have survived being a teenager with a fast little convertible, and to have found five pesos under the couch a couple minutes ago. There’s a lot of luck involved. I can’t take credit for everything. So anyway, we didn’t need more to travel, we just needed to be more efficient with what we had. Beyond what we need to live and travel, working to accumulate extra is a waste of my time. I can’t buy more time. That’s how it works for us. I’d never try to argue that one lifestyle is better than another (or even explain Colleen’s reasons)- but the way I live is the way I’ve gotta do it. Yay for you! Do it while you can and remember, to paraphrase an aviation saying, “Accidents cause people”. This is the right time of your life to do exactly what you want: the pitter-patter of little feet is a great thing, but it does restrict your lifestyle.